At the age of two, Carly Fleischmann was diagnosed with severe autism and an oral motor condition that prevented her from speaking. Doctors predicted that she would never intellectually develop beyond the abilities of a small child. Although she made some progress after years of intensive behavioral and communication therapy, Carly remained largely unreachable. Then, at age ten, Carly had a breakthrough. While sitting in her kitchen with her devoted therapist Howie, Carly reached over to the laptop and typed "MEAN," referring to Howie's efforts to get her to do her work for the day. She then went on to further explain her recalcitrant mood by typing "TEETH HURT," much to Howie's astonishment.This was the beginning of Carly's journey toward self-realization. 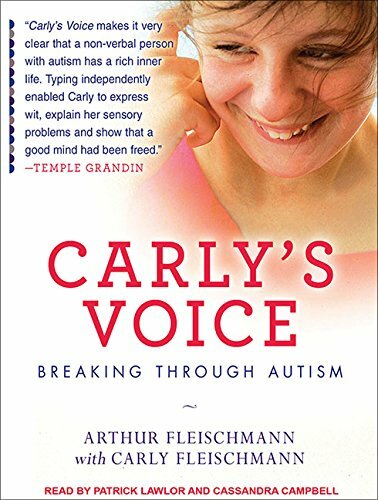 Although Carly still struggles with all the symptoms of autism, which she describes with uncanny accuracy and detail, she now has regular, witty, and profound conversations on the computer with her family, her therapists, and the thousands of people who follow her via her blog, Facebook, and Twitter. A 2009 segment on 20/20 brought her story to national attention, and she has since appeared on television with Larry King, Ellen DeGeneres, and Holly Robinson Peete, all of whom have developed warm relationships with her.In Carly's Voice, her father, Arthur Fleischmann, blends Carly's own words with his story of getting to know his remarkable daughter. One of the first books to explore firsthand the challenges of living with autism, it brings listeners inside a once-secret world in the company of an inspiring young woman who has found her voice and her mission.